Aaron Neuwirth reviews Welcome to Marwen, another visually ambitious project from director Robert Zemeckis, featuring Steve Carell as an artist who suffered trauma. 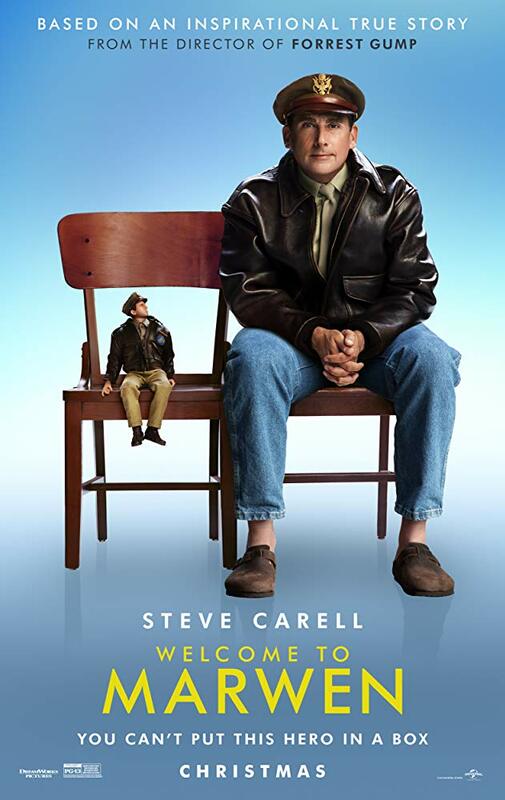 It appears Welcome to Marwen is stuck in a position that falls in line with “the book was better.” Robert Zemeckis’ has crafted another ambitious and imaginative feature, but given the existence of an acclaimed documentary (2010’s Marwencol) covering the same subject, I think it may be time to hold off on these dramatizations. To its credit, Welcome to Marwen has a lot going for it that allows for a film far more interesting to watch in full, compared to the mixed message sent by the marketing. However, for a movie dealing with the struggles of a man suffering from brain damage, this story could have used some clearer focus. Steve Carell stars as Mark Hogancamp, the victim of a hate crime (he was savagely beaten by neo-Nazi thugs, to make it clear). Once a talented artist, Mark now has little memory of his life before the attack, and spends most of his time in a literal fantasy world. Having constructed a miniature WWII village called Marwen in his yard, Mark takes beautiful photographs of his town, while also imagining stories involving the various figurines placed in it, based on himself and the many women he has met. Zemeckis co-wrote the screenplay with Caroline Thompson, one of Tim Burton’s best collaborators, and I would have hoped this combination could deliver a more successful final product. 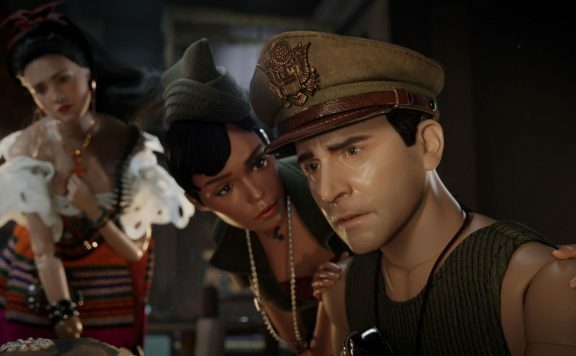 Between cinematic ambition and a way to craft well-placed emotion around stories involving those who are “different,” Welcome to Marwen has all the elements needed to work as an excellent drama that uses its unique visuals to tell a touching story. It’s a real shame this screenplay falls so short of producing that satisfying experience. A talented cast is no match for a plot that drops in and out when it comes to critical moments that should leave an impact. Certain characters only appear to drive things forward but are quickly dismissed. Other aspects of this story feel crucial, but are only given partial development or shown in glimpses. At just under two hours, I can’t tell if moments were lost in the final edit, or the film just didn’t operate on a strong enough level to have me tied over when thinking about the many different ideas, situations, and people introduced in this film, but I know I wasn’t content. It’s unfortunate too, as there is a lot of good stuff to consider. The visual effects are very impressive. Seeing Carell and others as figurines is the sort of visual creation that has me wondering how it was achieved in at a time when I’ve watched enough behind-the-scenes footage to have a good read on things when it comes to movie magic. Watching these fantasy sequences allows for a level of levity to come through while working to explore the shocked state of mind Mark is still dealing with. Given Zemeckis’ time spent in fully CG worlds via his motion-capture films (Beowulf still rocks! ), the film even has a few action sequences that end up being quite exciting. This cast is also good, even when considering how thin most of the roles are. There’s an argument for being irritated by the film’s depiction of women, as they are all serving Mark to some degree, with a few sequences that cross the line of creepiness due to a lack of further exploration. However, for what’s given and the fact that we see all of this from Mark’s perspective, the film works to keep everyone reasonably likable. Leslie Mann comes across best as Nicol, Mark’s new neighbor. The way she accepts this guy with no judgment (Mark has an affinity for women’s shoes) comes across in such a nice way that I wish the film had more to work with as far adding depth to this relationship, beyond being a prize Mark desires. It’s to Mann’s credit that a wildly uncomfortable proposal scene ends up playing better because of how she takes control of the situation. Elsewhere, you have Merritt Wever as a friend who wants Mark to notice him. It’s a weak enough role to have you impressed by how Weaver makes it seem sincere anyway. Then there’s Janelle Monae, Eiza Gonzalez, and Gwendoline Christie as other real people in Mark’s life who also serve as soldier figurines who help Mark’s character in Marwen. Lastly, Diane Kruger is Deja Thoris (a John Carter of Mars character name for those of you needing a trivia point), the Belgian Witch of Marwen, who acts as the curse holding Mark back from being happy. It’s a weird additional part that makes some level of sense, yet the film can’t quite connect all the dots for the better. 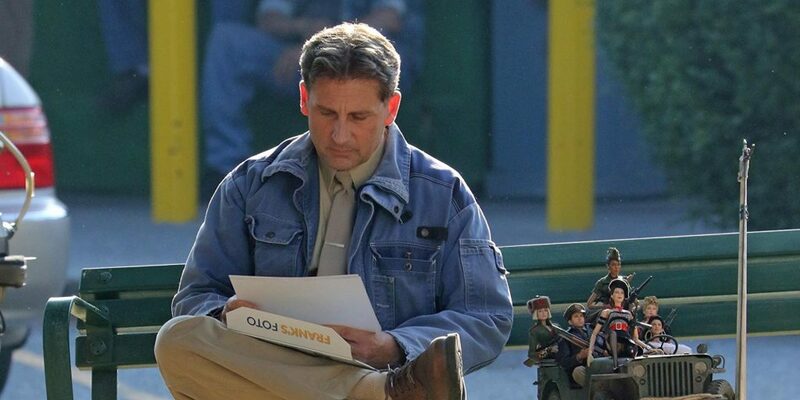 Welcome to Marwen is a strange flick for much of its runtime, as the film banks so heavily on us caring about Mark that it forgets to explore him beyond a surface level. It makes a choice as far as how much we are allowed to know about this man, as there are no scenes involving Mark before the beating took place, but what we are left with is a guy only defined in so many ways. Carell does what he can, but I once again find myself seeing the limits he has as a dramatic presence when not afforded a better script (see also: Beautiful Boy). He can take on the persona of his more confident figurine, but that matches a sort of comedic energy we are more used to seeing, and one he seems more comfortable in. I wish the stuff going on here led to a better movie, an inspirational film. Welcome to Marwen wants to be a story about having confidence in who you are, not backing away from those who try to hurt you, and other positive affirmations, but it falls short. Yes, there’s a sense of warmth that comes from Alan Silvestri’s triumphant scoring in key moments, but that doesn’t make up for a script that doesn’t find enough time to explore the real world. Losing out on that robs the fantastical elements of their power, no matter how terrific a visual effect they may be. That’s a shame, as it seemed like Marwen would be a nice place to visit, rather than just a quirky spot to note on a map.